Natural gas compressor station in northern Alberta, Canada, powered by Waukesha 7042 GSI engines. 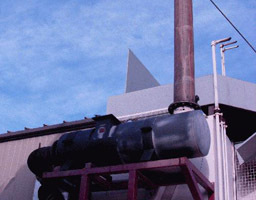 The challenge was to meet emission targets for NOx, CO and non-methane hydrocarbons, for a variety of compressor engines with different exhaust configurations. DCL supplied the catalyst housings in two basic configurations for this project. The first configuration was a separate catalyst housing and muffler. 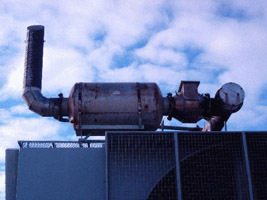 The second configuration was a combined catalyst housing and muffler in one unit. All the catalyst elements were arranged in the DCL QUICK-LID®, which allows the catalyst elements to be easily removed for servicing.